Last issue you reported on a house fire in Suan Dok, well that house is one of our neighbors here at Magical Light Foundation. A small house behind Wat Suandok belonging to a 83 year old widowed granny, Wandee Wanchai was completely destroyed by fire on the morning of 25th January. She has been living in that house almost all of her married life. She was in that house with her elderly son when the fire broke out. She also has another married daughter who is staying in Mae Taeng. The fire fully consumed her house and partially destroyed and damaged a few of her neighbors’ properties too. Investigation shows that the fire started from her house due to an electrical wiring fault in her house. Her small piece of land has since been cleared of most of the debris caused by the fire. The local community in Suthep has set up a donation box on her property to collect funds, but the priority of the Suthep communities was to use the collected funds to help replaced damaged areas of the other houses affected by the fire first. 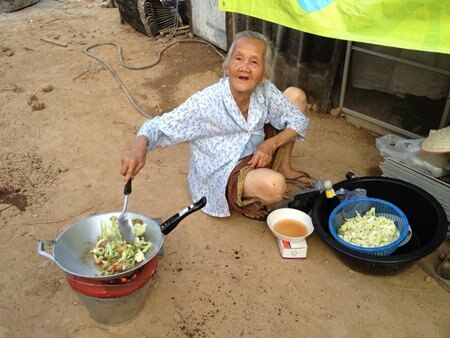 A few local charity foundations will be raising funds for the granny to rebuild a simple house. The construction will start after all the neighboring properties are restored. Rebuilding her house is expected to start in about a month time. Magical Light Foundation visited Wandee a visit on 13th February; she is now staying with kind neighbors who have offered her a roof over her head. She says she only had the clothing on her back when she escaped from the fire. We asked her what she needed at this stage. She says that she was very fortunate that well-wishers have given her clothing and other basic daily necessities. What she needed most immediately was a mosquito net. We went to buy her a mosquito net straight away and pass it to her on the same day. Magical Light Foundation has decided to assist in raising funds to help her buy household necessities and other furnishing when her new house is ready by April. Those who wish to help Granny Wandee please contact Magical Light Foundation at http://magicallightfoundation.org/ for more information, we are located directly behind Wat Suan Dok. I was so disappointed to find out I completely missed the plant fair at the Flower Festival. I know that normally it is held at Buak Haad Park but somehow thought that everything was being held at Tha Pae this year. I went to Tha Pae and couldn’t find any plants or flowers for sale and so went home. It was too dark to see the floats and while the electric light display was pretty this is, after all, the Flower Festival and not the Electric Light Festival. I found out later that the plant market was still at the park but unfortunately for me, found out too late. I love going to the plant fair and buying an orchid or two (or three!) and viewing the award winning bonsais and orchids. To me, that is the best part of the entire Festival! I don’t know why they split it into two different places on completely different sides of the old city but I hope next year they consolidate it into one place again. Now I have to wait a full year before the next one. Amazing but true, Thailand is not even in the top 10 most dangerous. If you include motorcycles then it’s a very different story.. of course. Also amazing, despite Russia being the worst, only 10% of fatalities in cars in Russia are a result of drunken drivers. The WHO info shows road deaths per 10,000 of population then subdivides by Motorcycle, Car, Pedestrian and Cyclist. Whilst there are more road deaths in Thailand than the USA, there are less car accident deaths per 100,000 of population in Thailand than there are in the USA, in fact only 13% of road deaths in Thailand are in a car, a whopping 79% are motorcyclists with the remainder being pedestrian and cyclist. Other interesting stats about Russia, it has 84 murders per day in a nation of 143 million people. That’s one murder every 18 minutes. However... Russia is not in the top 10 most dangerous countries to take a holiday. Most Dangerous Countries to Holiday. There are the countries where statistically you are more likely to be injured, killed or be a victim of crime. What a surprise to see USA at number 2, however the numbers don’t lie. I missed the plant fair at the Flower Festival!